Johannes Brahms was introduced to the public by Robert Schumann in 1853 when he was 20 years old. For several years he was music master to the prince of Lippe-Detmold. In 1858 he ended his engagement with Agathe von Sieboldt after Clara Schumann visited them at Göttingen. Brahms had assisted Clara after her husband's death and there were emotional ties between them. When Clara saw the intimacy between him and Agathe she left without saying goodbye. Soon afterwards Brahms ended the engagement. In 1861 he fell in love with Clara's daughter Julie and he wrote a song for her, hinting on 'living in Vienna'. Clara and Julie didn't understand and Julie married an Italian nobleman. After Stockhausen became conductor of the Singakademie in Hamburg instead of Brahms he left that city for Vienna. Between 1864 and 1869 he travelled and gave concerts and it was only in 1872 that Vienna became his home, allthough he lived near Heidelberg between 1874 and 1878. From 1878 onwards he solely worked as a composer. In 1868 he had lost another love. He was piano teacher to the talented Elizabeh von Stockhausen but had to end the lessons because of his emotional involvement. She married the composer Heinrich von Herzogenberg, but they remained friends until her death in 1892 and Brahms always carried her picture until his death in 1897. 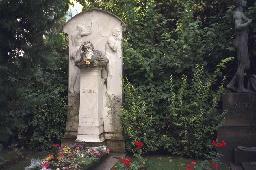 The grave of Johannes Brahms at the Zentralfriedhof, Vienna. Statue of Johannes Brahms by Rudolf Weyr at the Ressel Park near the Karlskirche in Vienna. 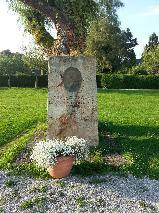 Johannes Brahms memorial in Tutzing, Bavaria.